As families prepare for back to school, it’s time to plan for morning success. If your typical a.m. begins and ends with smiles, high-fives and time to spare, read no further and congratulate yourself on parent of the year. If, however, you’re searching for new ways to get out the door on time — and with a little sanity left for the day ahead — here are a few ideas to consider. Rehydrate - After several hours of sleep, our bodies crave fluids. Drinking a full glass of water first thing in the morning not only helps flush out impurities, but also aids in a healthy flow of oxygen, helping everyone stay more alert and energized as they begin the day. Remember this for you and the kids! Get Enough Rest - Good mornings actually begin the night before. Sleep deprivation has become a national epidemic for adults and far too many children, especially teens. Just how much sleep should kids get? Teens should get at least eight hours, and younger children need between 10 and 12 hours. Have a Weekly Breakfast Plan - Avoid a week of Pop-Tarts, by letting the entire family participate in choosing the week’s daily breakfasts. Then have all the items either prepped or prepared beforehand for easy morning accessibility. Set out bowls and ingredients for older children. Think Protein - A high protein breakfast is good for growing bodies. It also helps replenish and repair essential tissues while refueling our energy stores. Try some peanut or almond butter on toast, eat Greek yogurt instead or regular or mix your morning banana with some cottage cheese. Let There be Light - And at the right times, too. There’s a powerful connection between light levels and our body’s chemistry. It’s important to understand that bright blinking electronics at night can interrupt sleep cycles, as well as the positive effects morning sunlight produces. 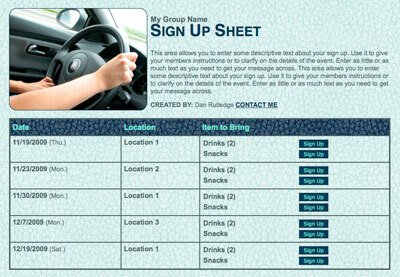 Set up a school carpool using an online sign up! SAMPLE. Check the Family Calendar - Reduce morning emergencies by reviewing the next day’s needs. Time to turn in that permission slip? Supposed to bring two-dozen cookies to preschool? Did you pack the soccer practice clothes? Create a digital calendar with automatic alerts if you’re prone to forgetfulness. Genius Tip: SignUpGenius sends email or text reminders, so you never forget that duty-free lunch shift you signed up to cover. Set a Bedtime Alarm - This may be just as important as the morning one. Create a reminder that it’s time to wind down and prepare for rest. Get in the habit of doing this a few weeks before school starts to ease the transition. Equip all Backpacks - This sounds like a no-brainer, but make sure to check on afterschool needs for the day. Are you going straight from school pickup to dance? Nothing derails an afternoon faster than realizing you’ll be late because you forgot that leotard. Prepare the Next Day’s Clothes - This doesn’t mean making a mental decision on a coordinating outfit — actually set aside each piece, including socks, undergarments, hair bows and baseball caps. Make sure a parent won’t need to iron it five minutes before departure. If you’ve got an indecisive child, set out two choices the night before and let them pick with a set of fresh eyes. Don’t skip this step the night before Wacky Wednesday or spirit day and risk forgetting the event altogether. Prep Lunches - This is harder to work into your schedule than it sounds. (After making dinner and getting the kids to bed, you probably either want to veg on the couch or go to sleep yourself.) Even if some items need to wait for morning, it helps to get a head start. Set aside a part of your evening — after you clean up the dinner dishes, for instance — and work it into your routine until it becomes automatic. Assign a Specific Place for Morning Items - From lunches and school notes to permission slips and backpacks, have a consistent drop spot to shave valuable minutes off your departure time. Organizational systems are always on sale, so take stock of what would actually help in your house. Do you want kids to have individual baskets? More hooks for jackets? Plus, don’t forget your own needs. Work necessities and to-go coffees need to be easy to access. Understand the Power of Routine - Practice actually does make perfect, and consistency is key to success. Research shows establishing a habit can take anywhere between 21 and 66 days, so don’t expect changes overnight. Remember starting a new school schedule takes patience and determination. Wake up Before the Kids - If you’re a night owl, you might not like this one. Breathing in the silence even just a few minutes before the morning chaos begins can help ease tensions and set a peaceful tone for the entire day. Grab a run or workout a few days a week or just get up and take a shower earlier. It’s one less thing to bring you worry. Plan to be Early - Take the phrase “Being early is on time, being on time is late and being late is unacceptable” to heart. Building in that extra time can make all the difference when the unexpected arises. And for most of us, that’s the rule much more often than the exception. Establish Consistent Bedtime Routines - Those old but wise words of Benjamin Franklin keep getting harder to follow, but still ring true: “Early to bed and early to rise, makes a man healthy, wealthy and wise.” Remember that advice from earlier about how much sleep your kids need? Calculate how much time it takes for them to wind down with how much sleep they require, then start the bedtime routine from there. Find Kid-friendly Alarm Clocks - Sharing responsibility for that first wake-up call is a great way to smooth out the morning. Luckily, retailers have just about every color, size and character available. If you have older children, consider asking them to park their cell phones downstairs in a charging dock overnight and use a traditional alarm clock instead. Minimize Distractions - Beware of the hidden time snatchers. The familiar background noise of the morning news may slow down the already sluggish. Don’t want little ones to turn on the TV in the morning? You may have to hide the remote. Plan a morning walking group with an online sign up! SAMPLE. Keep Them on Task - Gentle verbal reminders like, “It’s now 7:05, just making sure you’re dressed and on the way to the breakfast table,” work wonders for some, but for others, visual reminders such as checklists and colorful time charts work best. Try not to start the morning with a screaming match if at all possible. Praise the Positive - Compliments can go a long way to diffuse the morning rush. Don’t miss any opportunity to acknowledge good behavior when you see it. Try Music - This may initially seem like one of those distractions we mentioned above. But playing upbeat music while the family gets ready can be very energizing. Just remember, you know your kids’ unique styles. Too much noise early on may lead others to extra frustration and incapacitating grumpiness. Move the Alarm Clock - If you have a family member with an excessive snooze button issue, make them get out of bed to hit the snooze. Try placing the loud beeping alarm across the room or across the upstairs floor. Humor Them - Yes, you may suffer the consequences of delivering the “lame jokes” so early in the morning, but they woke up to groan, right? Even a little giggle was worth it. Positivity makes everyone feel better in the morning. Set Consequences that Matter - Knowing they will have to wake up 30 minutes earlier for a lack of cooperation may do the trick. For others, it might be losing a favorite afternoon treat or television show time. Just make sure your rules are clear and consistent. Reward their Triumphs - Has it been a whole week of getting up on time, accomplishing their morning tasks and not physically hurting a sibling in the process? It’s time to celebrate with a Friday night reward. Know your Family’s Needs - Every family and child are so beautifully different, so there’s never a one-size-fits-all morning plan. This year, plan to take time to examine opportunities for improvement and a smoother start to each day. Mornings don’t have to devolve into stressful power struggles. Teach your children good habits from the start, and you’ll reap the rewards for years to come. I needed some of these tips to get my 7 yr old started. Thank you! Organize media center volunteers with a sign up.